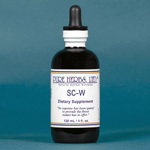 SC-W - Provides nourishment for the maintainance of healthy skin. * (Whole Apricot, Black Cohosh, Quince, Saw Palmetto, A.C.S., Herbal Adjustment, Echinacea, Wheat Germ, Wild Rose Hips). scw. SC- W (SKIN CARE) - Is designed and formulated to care for the skin. It nourishes the skin, cleans, protects, tones, strengthens, oxygenates and repairs it. Its carefully selected teammembers perform known and desired functions all on their own, and when combined, act in a coordinated manner to offer us something new for the skin. WHOLE APRICOT cleanses, improves circulation and kills bad cells. BLACK COHOSH neutralizes poisons and destroys viral irritants. QUINCE preserves moisture and soothes. SAW PALMETTO is hormonal and ensures that reproductive areas of both sexes are properly maintained and properly developed (SEE: SAW PALMETTO for more information). A.C.S. (All Cells Salts "Minerals") nourishes and tones the skin with mineral elements from sea and land vegetables. HERBAL ADJ. (Herbal Adjustment, SEE: HERBAL ADJ.) strongly promotes and normalizes circulation to keep the skin healthy, moist and oxygenated. ECHINACEA is the antibiotic surgeon, without a knife, to sweep away dead cells and promote immunity for healthy cells. WHEAT GERM oxygenates, encourages healthy, new cellular growth and repairs irritated areas. WILD ROSE HIPS are a universal supply source to fill in any missing nutritional gaps. They contain a protective natural Vitamin C, or "body glue", which keeps the cells of the body stuck together and prevents aging. DANDELION LEAF is the source of natural, all purpose Vitamin A for correcting any skin or eye problem. S.C.-W is the finest nature has to offer. Enjoy it. COMBINATION:Whole Apricot, Black Cohosh, Quince, Saw Palmeno, A.C.S. (All Cells Salts), Herbal Adj., Echinacea, Wheat Germ, Wild Rose Hips, Dandelion Leaf. DOSE:Apply to skin as needed and desired, after bathing, shaving or cleansing. As this formula contains a form of red pepper, avoid contact with eyes. Flush with water and remain calm if contact is made. *This product has not been evaluated by the Food and Drug Administration. This product is not intended to diagnose, treat, cure or prevent any disease.